This stunning Diamond Set Claddagh Triangle is a classic take on a historically important Celtic symbol. 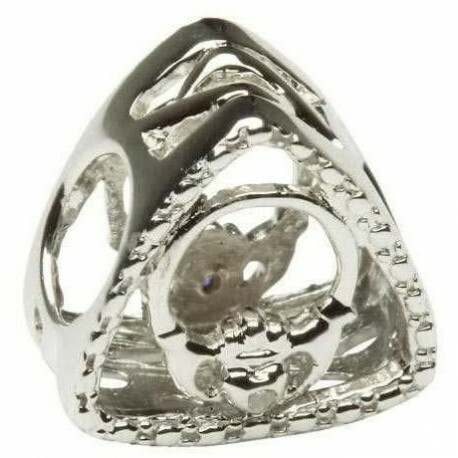 The Claddagh is seen here inside a triangle encasement of sterling silver. This stunning Diamond Set Claddagh Triangle is a classic take on a historically important Celtic symbol. 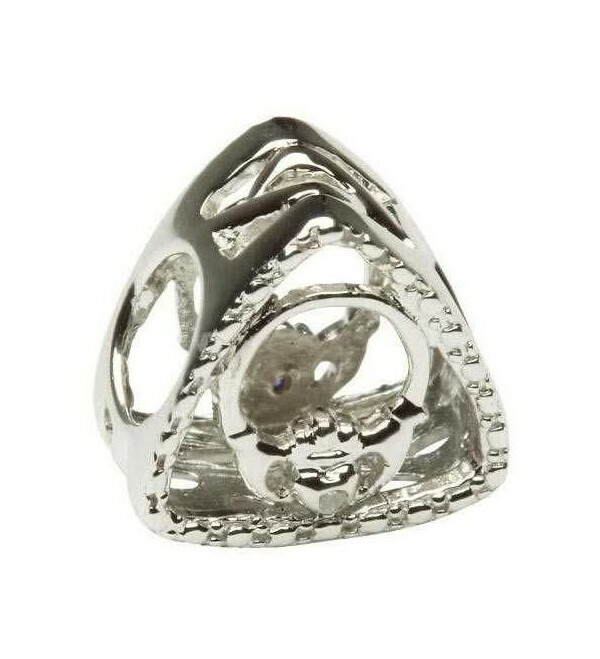 The Claddagh is seen here inside a triangle encasement of sterling silver. The incidence of three throughout this piece is a subtle artistic element added to bring another Celtic element from our Tara’s Diary Collection Jewelers. Celtic lore has been used throughout the ages and is recognized by its iconic symbols, such as the Claddagh. Seen here are two delicate hands representing friendship, who hold a heart of love. Overlooking this precious relationship is the adornment of a crown to represent loyalty. The Claddagh reminds us of these three important facets of life. The triangle, with three points recalls the Christian trinity of God the father, the son and the holy ghost. Each and every jewelry piece from our acclaimed Tara’s Diary Collection is made with extreme attention and care. All the points in this distinct Claddagh Triangle were created by the inspiring mind of a Shanore jeweler. With the artisan quality of this piece, you can be assured it is uniquely yours and shines with that unmatched individuality.